I can remember reading the ‘Little House’ books by Laura Ingalls Wilder over and over again as I grew up in southwest Iowa. I never grew tired of Laura’s stories of life on the western frontier. And though I knew Laura was telling stories of her life, I never imagined that I would be able to visit the places where Laura once roamed the prairies. In the fall of 2012 I shared the ‘Little House’ books with my own girls, who loved them as much as I did (my eldest can still be found with a ‘Laura book’ when she has a bit of quiet time). Then, last summer, I surprised them with a trip to “visit” Laura in South Dakota. Five of the eight books Laura wrote about her life took place in and around DeSmet, South Dakota. From the family’s move in By the Shores of Silver Lake through These Happy Golden Years, Laura and her family settled, struggled, and survived on the often harsh prairie conditions of South Dakota. 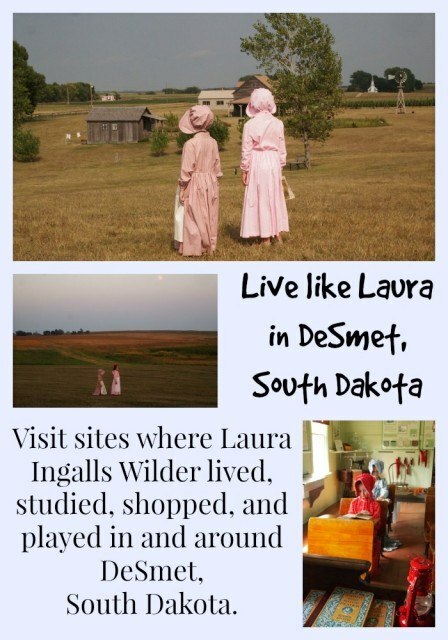 Begin your Laura explorations in DeSmet at the Laura Ingalls Wilder Memorial Society. Just next door is the Surveyor’s House. Reader’s will remember this as the largest house Laura had ever lived in – and the pantry was full of good food! 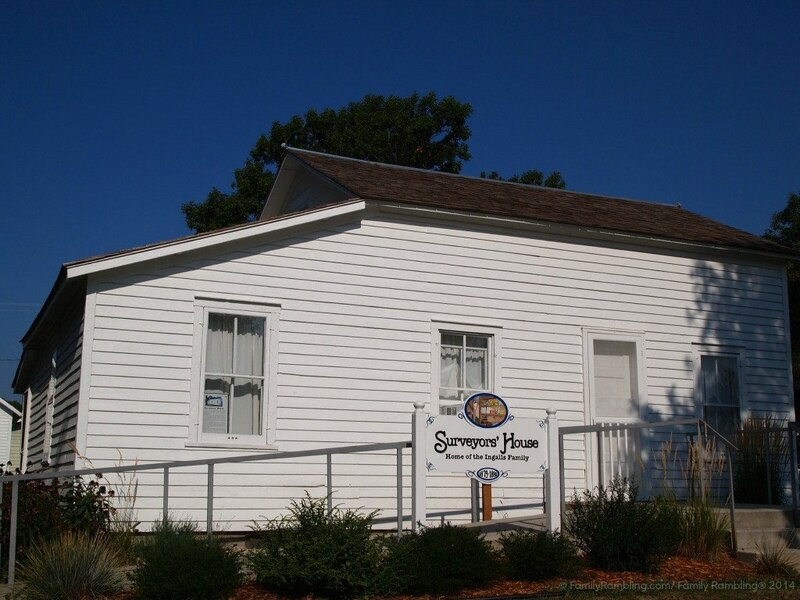 Also on this site are the original schoolhouse (where Laura rocked the desk for Miss Wilder) and a recreation of the Brewster Schoolhouse where Laura had her first teaching position. After touring these buildings you will drive (or walk) to the site of the Ingalls home in town. This house was built by Pa after Laura was married, but a visit is well worth your time. Here you’ll learn more about Mary, see the organ Laura paid for with the money from her second teaching position, and many other items that were owned by the Ingalls family. My personal favorite was the Pa’s big green book of the animal kingdom. From the house you can also see the church Pa helped build. Tip: You can pick up a map of “Laura sites” at the Memorial Society. My recommendation- return to the Memorial Society after your tour of the house pa built. Take the time to view the museum in back of the Memorial Society building, make a few purchases from the gift shop, and then head across the street to the Discover Center. Though not a “Laura site”, this is a fun, interactive place the kids will love. They can try on clothes, write in braille, and experience schooling like Laura did. Then you’ll want to head to the town’s original street. Though Pa’s store building is gone, you can still shop at the original Loftus Store. An entire section of the store is devoted to all things Laura and this is the perfect place to pick out a prairie dress or bonnet. In front of the Loftus Store – in new dresses! On the same street as the Loftus Store are the sites of places mentioned in Laura’s books: the Mead Hotel, the Wilder Brothers’ Store, Fuller’s Store, and Pa’s Store. Looking at the locations of these buildings and remembering ‘The Long Winter’ gives you an idea of how harsh that winter must have been. Heading out of town to the west you can visit the DeSmet Cemetery where the Ingalls family, minus Laura, are buried. You’ll also find a dozen other people you ‘know’ from Laura’s books including Mr. & Mrs. Boast. Leaving DeSmet and heading east along Highway 14 takes you across the Big Slough and to the site of the Ingalls Homestead. This is the land that Pa would have lost had Mr. Edwards not overheard the men who planned to jump him when he went to stake his claim. Though the original house and barn are long gone, the buildings have been recreated using Pa’s descriptions and drawings. It is here on the homestead that you can really ‘live like Laura’. See what a dugout and shanty house were really like- and try to imagine a family of 5 living there. Visit the chickens and cats in the hay-roof barn. Then make your way to the ‘Little House’ where you can create crafts and games, while outside you can try your hand at doing laundry. In the far barn is the opportunity to make a corncob doll, a rope, and twist hay into kindling. 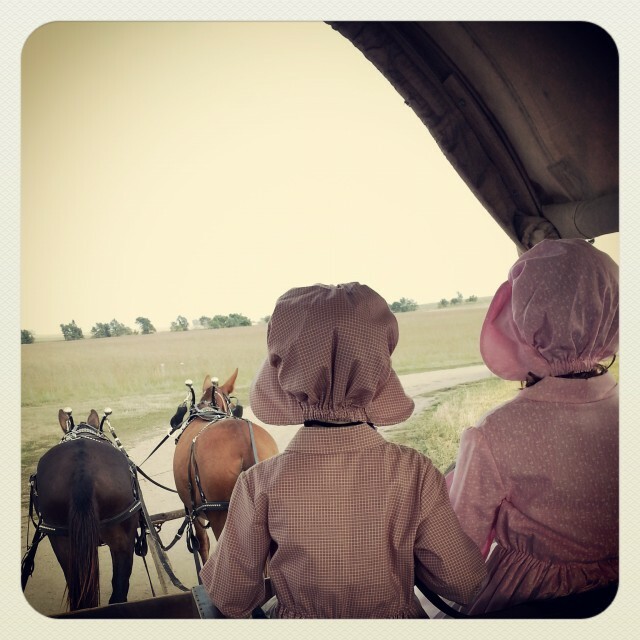 Be sure to catch a covered wagon – you might even get a chance to drive! 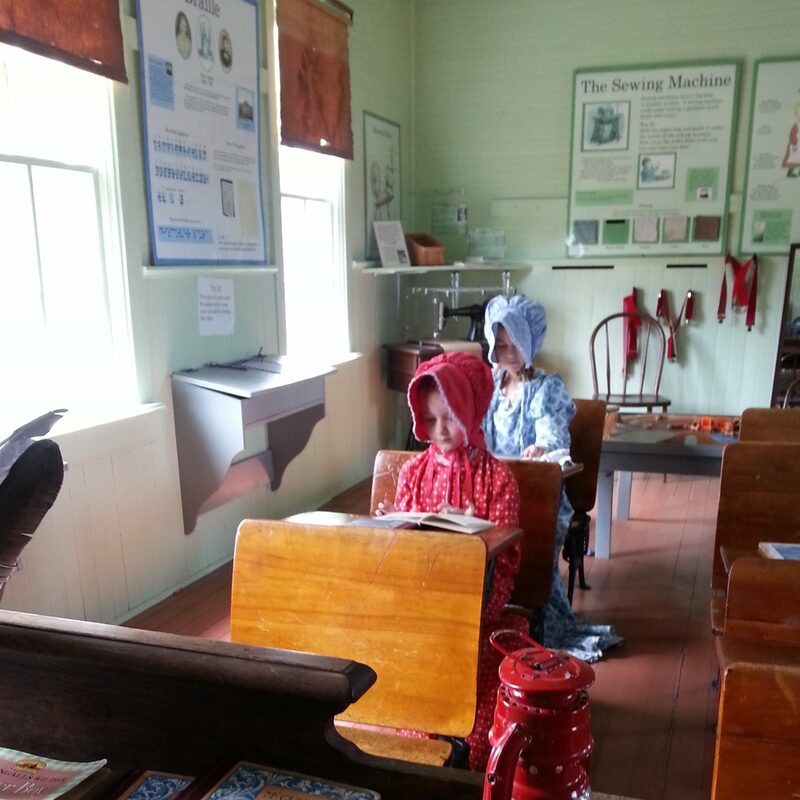 – to the Johnson Schoolhouse where Marian Cramer shares her tales of going to school in a one room schoolhouse. 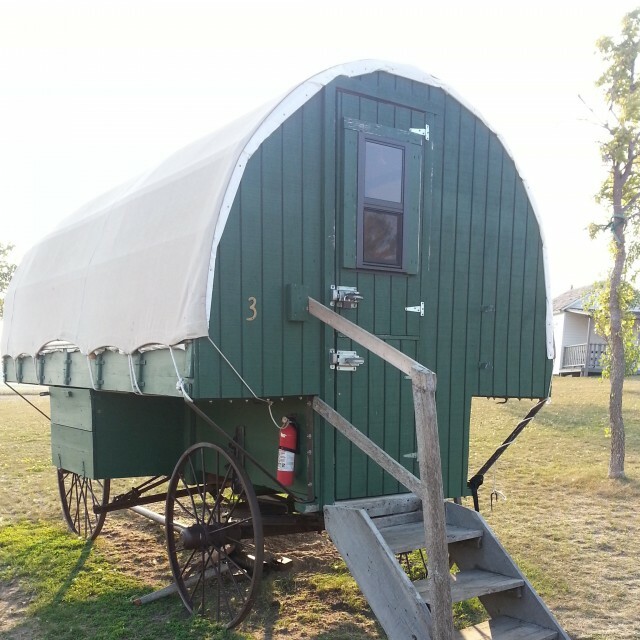 To make your visit especially memorable, reserve a Covered Wagon for a night or two. Our wagon slept 4- and didn’t leave a lot of room- but it was definitely an experience the girls enjoyed! Our space included a picnic table and fire pit, but the best fun was had running across the open land with new friends. My girls still talk about our visit to DeSmet, where Laura’s books ‘came to life’ for them. If you are a fan of the ‘Little House’ books, DeSmet, South Dakota should be on your bucket list. DeSmet has 2 hotels and 2 B&Bs. Compare DeSmet lodging options. Camping: A few RV sites are available at the Ingalls Homestead. Nearby Lake Thompson, one of the ‘Twin Lakes’ in Laura’s books, has a very nice campground. Eating: Ward’s Store and Bakery, across from the Loftus Store, serves tasty lunch specials. The Oxbow Restaurant on Highway 14 has the best breakfast in town. DeSmet History: Visit the DeSmet Depot Museum and the DeSmet Library for more pioneer history. 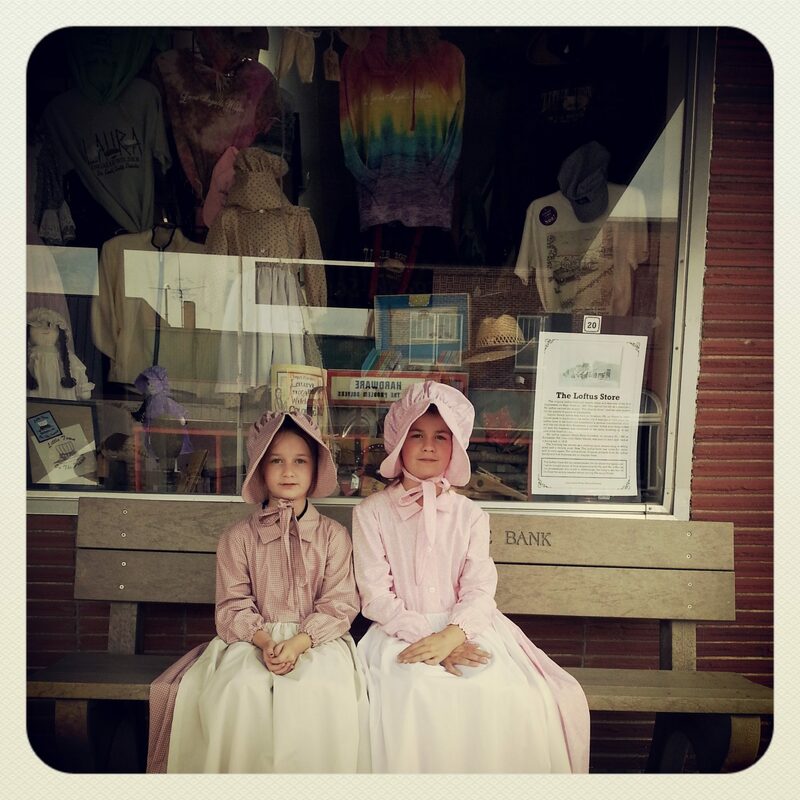 Shopping: For Laura souvenirs and other fun gifts – The Ingalls Homestead, The Loftus Store, Ward’s Store and Bakery, and Prairie Town Gifts. 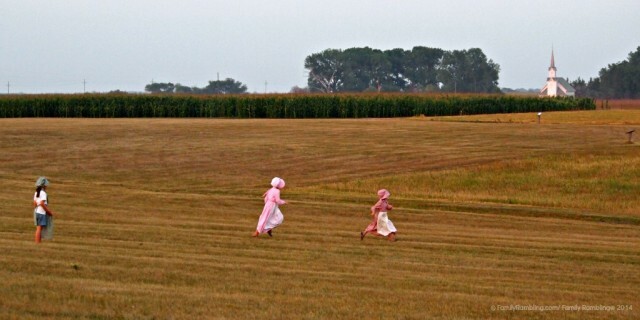 Family Rambling would like to thank The Laura Ingalls Wilder Memorial Society, the Ingalls Homestead, the Loftus Store, Ward’s Store & Bakery, and Prairie Town Gifts for their hospitality during our visit to DeSmet.